Day laborers, street musicians and beggars; this doesn't sound like a very meaningful choice of vocations! But these are the choices for the 1.3 million Hindu and Animist Dom people across India. Dom tradition says they were cursed by their gods to a life of poverty for killing a cow. 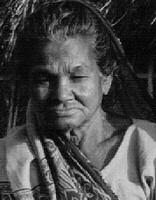 Dom women are definitely subordinate to the men in society, most often working in the home or supplementing the husband's income by begging. Women do, however, have a role in the ritual and religious spheres. These roles are reinforced by the manner in which Dom children are raised. Education is encouraged for boys, but not for girls. Most Doms are committed Hindus, with particular devotion to the gods Baba Ramdeo and Bhainro. The Baba Ramdeo temple in Rajasthan is a major tourist attraction. Along with this devotion, each family worships a deity of its own choice. There are also a significant number of Dom Animists who constantly make small animal sacrifices to deter ill luck. There are no more than a few hundred known Christian believers among the Dom population. * Pray for a spiritual breakthrough among the Dom people. * Pray that God would break down centuries-old bondages that keep the Dom people entrapped. 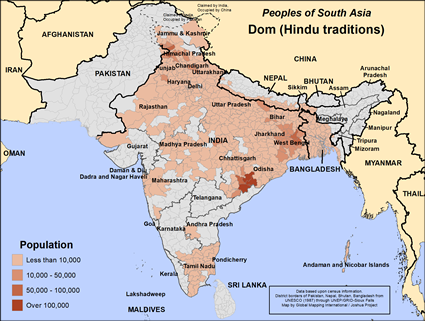 * Pray that God would use the Dom people to bring other untouchables to faith in Christ.View Dom (Hindu traditions) in all countries.